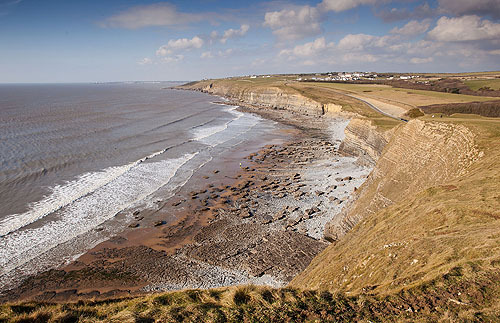 View to the west from the headland Trwyn Y Witch (Witches Point) over Dunraven Bay ( also known as Southerndown Bay or Seamouth) , with the village of Southerndown above. Seamouth Cottage (thatched) is on the path to the Heritage Coast Centre. This beach can become very crowded in summer.